What's the best VPN Service? VPN stands for Virtual Private Network. It does just what it says. It creates a virtual (as opposed to physical) private network for you by encrypting (or scrambling) each and every piece of data that goes from your computer out onto the Internet as well as any data that comes back to you from the Internet. So, who needs a VPN? If you're concerned about the rising problem of "hackers" - people who infiltrate computers and networks to steal or misuse information - you should be looking at a VPN service. Or, if you think your Internet Service Provider (ISP) may log, monitor, or analyze what you do online, a VPN is for you. 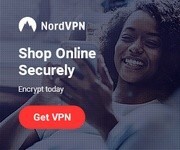 NordVPN helps you tackle the challenge of keeping your internet connection secure at all times on all devices in all places where you use the Internet. It provides military-grade encryption, blocks malware and advertisements, and utilizes a "double VPN" that doubles the encryption power. Along with the low price and the money-back guarantee, NordVPN earns our highest rating for the best VPN Service. Private Internet Access is a U.S.-based VPN service that provides a secure tunnel through which you can browse the Internet. It has instant activation and unmetered VPN transfer at the lowest price of all services we've reviewed. We love the low price but wish they had a longer money-back guarantee period. Cyber Ghost is a VPN service that protects your browsing and data from prying eyes of companies, governments, and shifty people on public WIFI. It offers a free trial and a 30-day money back guarantee, so it has a low risk of entry if you end up wanting to go with another service. However, they have problems with slow or unresponsive support and lack of support for Asia. Surfshark VPN is a quick and easy to use VPN service. They offer a very good online experience with unrestricted content, ultra-fast speed, and friendly support 24/7. They offer a 30-day money-back guarantee, so you have nothing to risk by trying their service..
VyprVPN is an advanced, self-contained, no third-party service where your data is encrypted and handled through their own servers as you browse the Internet, send and receive files, use video chat, or play games. We really like how VyprVPN caters to people who need the more advanced features, but were disappointed with the lack of refunds and logging of connection times and IP addresses. Buffered VPN is a VPN service that provides full encryption of all your Internet traffic for whatever devices you tend to access the Internet on. They have 24/7 customer support and high-speed unlimited bandwidth. They have servers in 40 countries. However they charge a higher cost and offer no money-back guarantee compared to other similar VPNs, plus people have had problems getting access to popular services such as Netflix and the BBC. Goose VPN is a VPN service that encrypts all your online communications. You get the privacy of browsing any site you like with the convenience of easy installation on any device you use. But it seems to us that the higher relative cost, lack of a kill switch and Netflix UK support, and annoying promotional emails without opt-out links knocks it down a bit. PureVPN claims to be the world's most reliable VPN service and has endorsements from The New York Times, Mashable, and cnet online publications. PureVPN comes with a 31-day money-back guarantee, which you may need to use: experts don't have positive things to say about the overall user experience of this VPN. TorGuard is a complicated matrix of different bundled or standalone services that you can match to your specific needs. They have over 3,000 servers in over 55 countries and their services even include advertisement and malware blocking. The problems that Better Business Bureau consumers told about TorGuard seem inexcusable given the good experiences other VPN customers we reviewed have had. IP Vanish VPN provides high speed, secure Internet connections across over 40,000 IPs, over 1,000 servers, and in over 60 countries. You can use this service to access any website, in any location, without fear of hackers stealing your sensitive information or governments and organizations spying on you. IP Vanish gets low marks because of its overwhelmingly bad Better Business Bureau ratings and customer feedback. Millions of credit cards can be exposed online at any given moment as people purchase things from popular ecommerce sites. If the ecommerce site you're buying from doesn't bother to encrypt that information, a hacker can "sniff" that information right out of your connection with the website. Anything you type into a vendor's website form becomes fair game for identity fraudsters and thieves. Furthermore, ISPs have been known to sell their user's information to marketers and advertisers. Or, they can use it to restrict (throttle) your bandwidth and block access to sites they don't want you to see. Finally, a VPN is useful for people who live in countries where governments regularly censor information not flattering to the state, or that they deem to be harmful to their citizens. Protests, rallies, and citizen actions that get started online usually don't have a chance of being successful without some type of VPN service protecting the organizers from being spied on. Features: Which VPN features set one service apart from all the others? Why is it important to have those features? Cost: Are their free trials and/or money-back guarantees? Is there a way to save more in the long term by paying quarterly or annually, or even longer? Reputation: How do current and former customers feel about their experience using a particular VPN solution? If they had a bad experience, how long had they been using the VPN? Security: Are there redundancies and safety nets built into the system in case of failure? Are logs kept of your activities? Are there enough IP addresses and servers scattered throughout the world to more effectively hide every user's activity and location? Performance: Are VPN connections significantly slower than unsecured connections? Customer Service: How quickly and easily can you get help from the VPN provider? How is the follow-up done? TopConsumerReviews.com has reviewed and ranked the best VPN Services available today. We hope these reviews will help you find the right VPN service to make browsing the Web 100% secure!